"九月三十日是「心越忌」9th month 30th day is "Death Anniversary of Shin-etsu"
This 2001/2015 edition of Toko Kinpu did not include the following eight melodies; note that the first three use non-standard tuning, the fourth to seventh are very different versions from here, and the eighth through tenth seem to survive only from the handbook published in 1898. All were in the Japanese handbooks from QQJC XII. The footnote below mentions some others that were not included. My initial understanding of this handbook has largely been based on Yang Yuanzheng, Japonifying the qin. Yang's discussion of the reconstruction of this handbook (the title of which he romanizes as Toko Kinfu) begins on p. 56. This handbook was reconstructed from a variety of sources but it is printed in a uniform style. What editing was done? This handbook, unlike the ones in QQJC, give the Japanese readers no indication of the pronunciation of the Chinese characters. Very few of the qin songs published in Japan exist in Chinese handbooks of the time. Does this mean they were mostly created in Japan? Its version of Gao Shan is very different from the one in Hewen Zhuyin Qinpu. The four waka have no lyrics and at least two the pairing do not seem correctly to match the apparent intended Tanka form. Further study will certainly bring more questions. Knowing the complete repertoire of (or available to) Shin Etsu and his students is complicated by the fact that, in lieu of Shin Etsu himself compiling a handbook, since 1676 so many people have published their own "Toko Kinpu" in Japan, all trying to pass on his tradition. Unfortunately, they were not all availabe to Zha Fuxi when he compiled the Qinqu Jicheng in the 1950s. In particular there were apparently some more complete ones he never saw. It is not yet clear whether the one published in 2001 largely replicates one such complete one, or is an amalgam of several. Sugiura, along with 人見竹洞 Hitomi Chikudo (1620～1688), were the best known of Shin'etsu's students; 小野田東川 Onoda Tozen, a student of Sugiura, became a professional qin teacher with perhaps over 100 students. All the songs in this handbook have lyrics, so in this quote they all seem to be referred to as 和歌 waka, though this should actually refer not to original Chinese poems published or set to music in Japan but to Japanese poems written in Chinese characters, as here. Some other early Japanese handbooks were also consulted (The reference for this is "2001坂田版東皋琴譜正本（1.序：寒斎「坂田」本 +2.譜：妻鹿本=1,2の合本）", but I have not yet seen it (妻鹿 is 妻鹿友樵 Mega Yusho 1826-1896) ). Some of the other important early Japanese handbooks are discussed at the top of Guqin Handbooks Published in Japan, with some information on later ones given later on that page. The research by Sakata Shinichi apparently determined that several of the melodies from Hewen Zhuyin Qinpu (said to date from "before 1676", meaning they must have been brought to Japan by Shin-Etsu in 1677, but actually surviving from a much later copy) were probably not actually part of Shin-Etsu's own repertoire. For an index of the works in 琴曲集成 Qinqu Jicheng, Volume XII/165-381, as well as other related information see Guqin Handbooks Published in Japan. Mr. Sakata is a musicologist, composer and violinist, but his deep love was for the guqin. Born into a family of biwa players, he became enamored of the qin in 1958 when he was able to have some lessons from Zha Fuxi while the latter was visiting Japan. At age 11 he met 劉老先生 an old Mr. Liu, who had been a student of 楊時百 Yang Shibai in China but had then moved to Japan, and for four years studied from Mr. Liu 洞簫 dongxiao and calligraphy as well as continuing to study guqin. Later, as an adult, Mr. Sakata studied qin from 田邊尚雄 Tanabe Hisao. In 1971 Sakata Shinichi founded the Tokyo Qin Society (東京琴社 Tokyo Kinsha). The chief editor seems to be 趙維平 Zhao Weiping, a professor at the Shanghai Conservatory. The first difference one notices between this and the handbooks published in Qinqu Jicheng Volume XII is that the latter all include along with the lyrics Japanese kana that give the pronunciation of the Chinese characters. I don't yet know whether these are in the Japanese edition or in the edition on which that one was based. I obtained my copy of this in December 2018 so my work on it is preliminary. The volume, originally by 杉浦琴川 Sugiura Kinsen, is also mentioned by Zha Fuxi as one he did not see. Further introductions to these pieces are mostly where they are included in the handbooks published in Japan>. Some pieces refer to a 草堂祕譜 Caotang Mipu (same meaning as 草堂秘譜); it is not yet clear what this is. The Japanese handbooks in QQJC are all in Vol. XII. Among the above 57 titles there seem to be 17 that were not included in the QQJC Japanese handbooks (some may have the same title but the music is quite different). It is perhaps noteworthy that all six of those without lyrics (the four waka at the end probably were intended to have them), are versions of full length melodies found in earlier handbooks. While it is true that there are only the six full length instrumental pieces in this Toko Kinpu plus perhaps two full-length melodies with lyrics in the Japanese handbooks included in Qinqu Jicheng Gao Shan and Gui Qu Lai Ci, it has been said that the inclusion of these full length pieces in the "orthodox" Toko Kinpu suggests that the level of play in Japan might have been higher than is commonly argued. Of course, this also leaves open the issue of whether it is in fact the pieces that seem the easiest are in fact the most difficult to fully master. 10 of these melodies (marked "NL") have no lyrics, though at least 4 of those 10 (i.e., the last four pieces) were almost certainly intended to have them. Note also that some versions in this Toko Kinpu Zhengben are quite different from the versions in QQJC XII. Examples of these include Gao Shan. This 2001 edition of Toko Kinpu did not include the above ten melodies: perhaps the editor(s) thought they dated from later than Shin-Etsu himself. All of them are in editions found in Qinqu Jicheng, three of them are from Hewen Zhuyin Qinpu: Libie Nan #1, Le Ji Yin and Gao Shan. Hewen is generally treated as an early handbook, so it would be interesting to know what the real origin of these three melodies is thought to be. 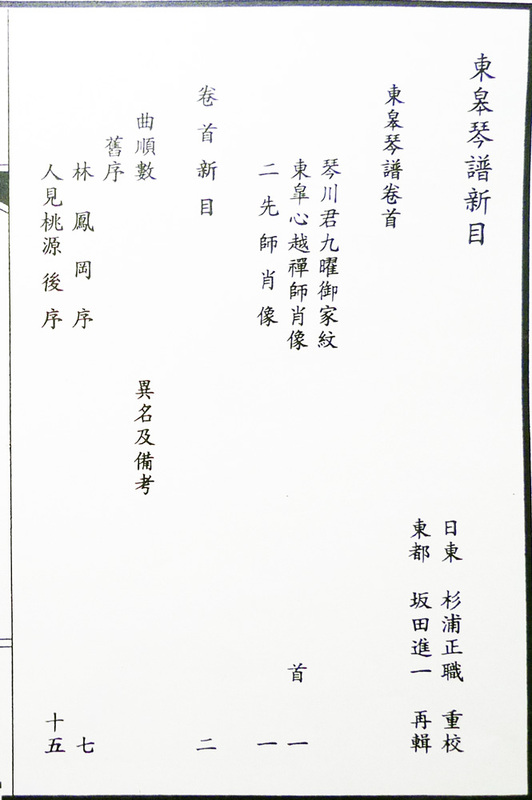 There is a chart dated 2009 (.xlsx; see pdf version), apparently based on the reconstructed 1710 Toko Qinpu Zhenchuan, that at the end mentions most of these melodies missing from that edition (for example, it doesn't have both editions of Libie Nan or one one section instrumental version of this Cao Man Yin, and 舟夜 Zhou Ye it calls 舟座 Zhou Zuo). The same chart also says that last three of the above melodies were included in one of the handbooks connected to Tokugawa Motoko. Both are said to be "東皋手挍 hand copied by Donggao" and both are said to be "曲肱軒藏譜 tablature from Qugong Xuan"); neither has been translated. Feng Wu Ming Pei and Xiu Zhu Yin Feng have been transcribed separately in Wang Di, Xian Ge Ya Yun, as #45 (p.110) and #48 (p.114) respectively. There they are identified as from Toko Kinpu but no mention is made that they are from this edition that was not publicly available at the time. Waking from moonlit dream, she feels a grief acute. To see 'neath willows people leave? She receives no letter from ancient Northwest way. Over royal tombs and palace walls. Yi Qin E is also transcribed in Wang Di, Xian Ge Ya Yun, #42 (p.106). As well as here, Zha Guide lists it in 1682 (XII/36), where it has the same form but different lyrics and music. The Wiki pages for Waka and Tanka distinguish between modern tanka and the classical version mentioned above. Yang (pp.70-72) has some comment on waka, with translations of two, Haruno and Yama Zakura. It is beyond the scope of this site to give much detail about the waka settings. However, the general idea can be found with the following introduction to the first waka above, 春野 Haruno; the specific name of the piece is 若菜 Wakana (Early Spring Herbs). There is a recording of Haruno/Wakana from the "Autumn Moon Studio" (秋月齋 Qiuyue Zhai) linked from a web page called wakana. My description below should be examined together with the commentary and linked mp3 recording. While my garment’s hanging sleeves, Are speckled with falling snow. The syllablic structure as shown here seems to be 5+8+5+7+7 not 5+7+5+7+7. Perhaps it is a coincidence that the tablature places and ornament on the extra syllable. In addition, the singer here seems to add an additional syllable in the fourth line (wa ka ga instead of wa ga). The Autumn Moon Studio (秋月齋 Qiuyue Zhai) also has other interesting recordings online, such as his rendition of a Gyokudo song, originally linked from here/.